See our powerful portfolio and resource management solution in action. This article is the first of a two-part series on the pending “talent cliff,” an important topic to professional services leaders. We discuss why this critical situation exists and provide some related insights from the newly published 2013 PS Maturity™ Benchmark for professional services. By now, most professional services executives realize it is increasingly difficult to find, hire and retain an exceptional consulting workforce in a tight global race for talent. The bad news is that it will only get worse in developed countries as workforce demographics change, the educational system continues in disarray and immigration policies remain rigid. To understand the growing human capital challenges, one must look at the trifecta of external forces that are creating the talent cliff. This year, the average baby boomer (people born between 1946 and 1964, as defined by the United States Census Bureau) will be 58 years old. 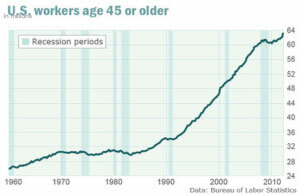 The graph in Figure 1 shows the impact that aging baby boomers are having on the U.S. workforce. In 2000, the number of older workers was 49.2 million. In 2012, this number increased to 63.1 million. While the number of workers older than 45 has exploded, the number of U.S. workers age 25 to 44 has fallen by 6.8 million. Every day, 10,000 U.S. baby boomers retire, meaning 3.65 million experienced workers exit the workforce every year. Historically, retirement begins to accelerate when people are in their late 50s. Analysts project that by 2018, there may be more than 5 million unfilled jobs in the U.S. And the number of unfilled jobs requiring STEM (Science, Technology, Engineering and Math) skills is projected to be more than 200,000. Unfilled jobs coupled with the loss of baby boomer knowledge, skills and experience could severely impact workforce productivity and the U.S. economy. Furthermore, the shortage of qualified replacement workers makes filling those jobs more difficult. One of the most important and hotly debated topics is the state of the U.S. educational system. Regardless of political perspective, the facts are sobering. On the 2009 Program for International Student Assessment exam, the U.S. ranked 25th in math, 17th in science and 14th in reading among 34 OECD (Organization for Economic Co-operation and Development) member countries. When the 37 partner countries (including China, Singapore and Taiwan) are incorporated into the list, the U.S. dropped to 31st in math, 23rd in science and 17th in reading. Clearly U.S. K-12 schools lag behind those in other developed countries. Further, an insufficient number of students who go to college are pursuing STEM disciplines to meet market demands for these skills. Microsoft recently published a report underscoring this labor shortage by citing that the company has 3,400 unfilled research, development and engineering positions in the U.S. And this workforce deficit is not just a U.S. issue, as recent headlines declare a worldwide labor shortage of critical IT skills. Multiple think tanks and nonprofit organizations have published extensively on this topic. While their proposed solutions for education system reform may differ, they all appear to agree on the future STEM-skilled workforce shortage. Immigration has been a powerful economic engine for the U.S. More than 40 percent of the U.S. Fortune 500 companies were founded by an immigrant or a child of an immigrant. The current immigration policy doesn’t provide the requisite number of visas needed to allow companies to recruit internationally to fill open jobs, specifically those requiring technology skills. Moreover, the worldwide shortage for these skills means U.S. companies hiring for domestic positions are competing against firms in other countries. The immigration policy in many other countries is strategically aligned to the urgent need to globally source these highly skilled workers. Ironically, many of these foreign workers may have been educated in American colleges and universities. Right now, no targeted immigration program exists to keep foreign students in the U.S. after they earn advanced degrees. Free White Paper: Your Project-Based Service Organization: Paper Plane or Rocket Ship? This article was originally published by SPI Research on their blog SPIglass. Planview has asked permission to publish these materials because of our interest and understanding that the subject matter is important to the project-based service community. Continue reading more on the topic of the “talent cliff” and PS Maturity on the SPIglass website. Click here to learn more about the Planview Approach to Services Resource Planning for organizations looking to combat the “talent cliff” with purpose-built technology. Jeanne Urich, Managing Director, Service Performance Insight (SPI) is a global research, consulting and training organization dedicated to helping professional service organizations (PSOs) make quantum improvements in productivity and profit. In 2007, SPI developed the PS Maturity Model™ as a strategic planning and management framework. It is now the industry-leading performance improvement tool used by over 6,000 service and project-oriented organizations to chart their course to service excellence.